Compare PVC vs Hypalon fabric for inflatable boats, rafts and kayaks. HomePVC vs. Hypalon Inflatable Boats. PVC vs. Hypalon Inflatable Boats. I often find while researching inflatable boats, kayaks, and the likes that many forums and web sites will be ridden with users claiming that Hypalon is in face the only choice for inflatable boats. It is typical to find someone making a rant of their poor experience with a PVC inflatable boat, but thankfully dozens of years of experience putting around almost every body of water I have come across has shown me that these “issues” don't simply arise. I would have to say that a majority of the complaints I have encountered regarding PVC result in the finger being pointed at the boater himself, more specifically a lack of maintenance and care. This is more often than not, the sole cause for a diminished life for an inflatable boat. 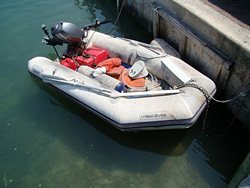 In practically every case I have witnessed of a PVC inflatable boat disappointing its owner, under-inflation is always prevalent, with neglect following a close second. 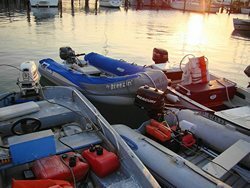 It is all too easy to overlook the proper steps that need to be taken when caring for a PVC inflatable boat, and these little oversights add up and unfortunately will shorten it's life span. It is recommended that when not using your inflatable boat that it be stored in a well ventilated, shaded area. It is extremely important to remember, and yet so easy to forget, that both heat and humidity take their toll on the glue used in the construction of the inflatables and to make sure that you never store your PVC inflatable boat inside a closed box or container, or in any place it may receive constant and direct sunlight. The combined factors often will result in humidity accumulating within the storage area, and overtime it will weaken the bond of the adhesive used. If the boat is constantly dragged behind your sailboat, left year round on a dock, or left dirty and directly under harmful UV-rays, you can't expect it to last forever. 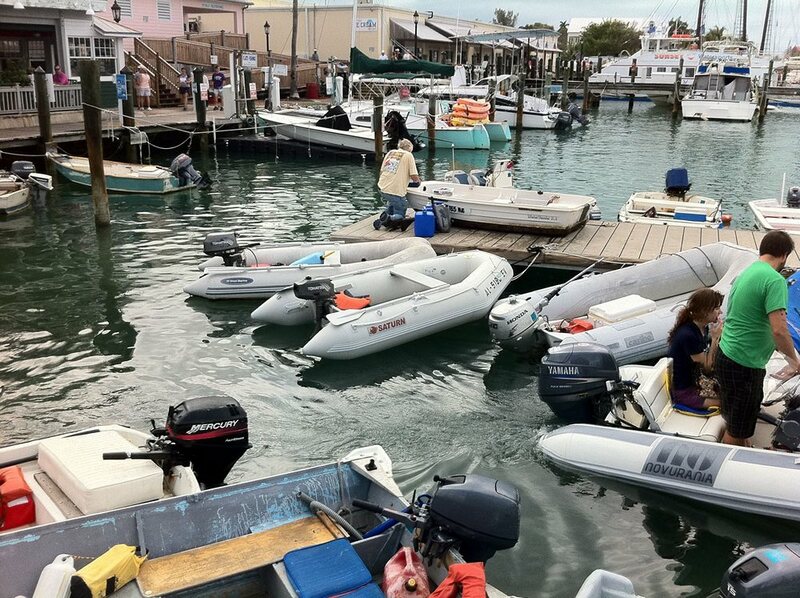 Ideally, when you are finished for the day using your inflatable boat we recommend that you take the few extra minutes needed to properly cover or deflate your PVC inflatable boat. A standard boat cover or even a simple tarp will greatly enhance the longevity of your inflatable boat. Although Hypalon is known to tolerate UV rays a little better than that of its PVC competitors, it will eventually break down to UV and Oxygen exposure. It does however resist hydrocarbons very well depending again on the quality or grade of materials used – This is a huge bonus for those of you who enjoy boating in large bodies of primarily methane, octane, hexane, acetone, crude oil, and the likes. While one of the key benefits of Hypalon being that it is a glued construction that requires scuffing in order to make the seams form an airtight bond, t is important to remember that for even a new Hypalon inflatable boat, the passing grade for air loss is 15% over the duration of a 24 hour period. In contrast, a PVC inflatable boat is allowed no more than 7% air loss during that same time frame. It is important to always remain aware of your current air-pressure while using your inflatable to ensure that you are operating at peak efficiency. 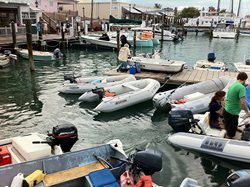 Many inflatable boat owners find that they need only properly inflatable their boat one time at the beginning of the season and that's the last they even think of it. With under inflation being the leader in causes of failure in any inflatable, we suggest before heading out you always confirm you are operating at your desired PSI or KPA, especially during times where the temperature may vary. Another point about Hypalon to keep with you is that DuPont has not produced it since back in 2010, so now anything else you purchase is most likely composed of neoprene/CSM these days. A lot of the adoring rants and positive feedback from Hypalon inflatable boat owners are making use of products produced to Military specifications, and as they are often Hypalon coated Neoprene that is of a much heavier weight and durability than that used in standard recreational brands its difficult to make a comparison. Most military boats are also decommissioned within their 2-5 year warranty time frame, so long term reviews and experiences are often few and far between. All in all, with Hypalon there is no doubt the extra costs endured are due to its far more labor intensive construction, requiring that all points and seams must be scuffed, and then glued by hand. PVC on the other hand has made leaps and bounds in technical advancement, but at its core is still the same Vinyl composition that will outlast mostly any expectations. Modern PVC is UV stabilized and treated with a number of protectants that inhibit the UVA and UVB rays that will ultimately age your inflatable boat. The main concern of PVC lies within the glue or weld used to join the materials together. The latter is a chemical process that when done correctly simply will not fall apart in the sun. With that being said, more than 9 out of 10 inflatables on the market today are made of PVC, or in some cases “Strongan” which is a trademarked material used by “Zodiac”. 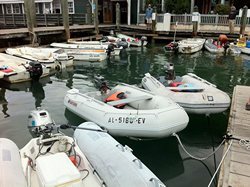 In the end, most reputable inflatable boat manufacturers regardless of material offer similar warranties on their products, and with PVC being far easier for even a novice boat owner to patch many recreational users choose to stick with PVC construction on their inflatable boats to maximize the value gained from their purchase at a fraction of the price. When it comes to my circle of inflatable boat owners, there are a variety of materials and models we have remained loyal to, and despite our differences the majority of us lack favorites because we simply care for, and properly maintain our inflatables. Again to conclude this point I cannot stress enough the importance of proper inflation, as it is really the only way to aid in preventing snags or punctures from fishing hooks, debris, rocks, etc. A properly inflated boat is also less likely to start delaminating, or start losing air from its seems – in the case of PVC that is, Hypalon will always leak to some extent however gradual it is something to keep in mind. I hope these few key points assist you in purchasing your next inflatable and aided in clarifying a lot of the mixed reviews given on both constructions. Best of luck in your search and Happy Boating!